The Federal Communications Commission intends to keep secret more than 200 pages of documents related to an alleged cyberattack that the agency says impaired its systems two months ago. The agency claims that it was bombarded in early May with traffic originating from a cloud service, which caused its website to crash temporarily while reportedly receiving more than 160 comments per minute on the topic of net neutrality. An entirely redacted letter between FCC staffers. A total of 16 pages were released to Gizmodo on Wednesday—though none of them shed any light on the events that led to the FCC’s website going down. The few emails by FCC staffers that were released to Gizmodo are entirely redacted. The agency cited a variety of justifications in explaining why it was refusing to release 209 pages related to the purported DDoS attack. Some of the records, it said, contain “trade secrets and commercial or financial information” which it deems “privileged or confidential,” citing the Trade Secrets Act. Other documents are withheld in an effort to “prevent injury to the quality of agency decisions,” citing a FOIA exemption that typically protects attorney-client communications but also extends to documents that reflect “advisory opinions, recommendations and deliberations” as part of the government’s decision-making processes. Still, other records concerning the cyberattack were not released because the FCC claimed disclosing them would “constitute a clearly unwarranted invasion of personal privacy,” citing a FOIA exemption that protects “personnel and medical files” from disclosure. “We have determined that it is reasonably foreseeable that disclosure would harm the privacy interest of the persons mentioned in these records,” the agency said. Bray had previously told reporters that the FCC would refuse to release any logs pertaining to the DDoS attack because they contain private information, such as IP addresses. Gizmodo, citing provisions of the federal FOIA statute, had requested that the FCC release “any reasonably segregable portion” of non-exempt material contained in documents it felt should be withheld. The agency did not, however, release any documents containing the redacted IP addresses and claimed those records were “inextricably intertwined” with material it could otherwise release. The material provided to Gizmodo did contain six emails from private citizens criticizing the agency over its position on net neutrality and for further failing to produce any evidence that its public comment website crashed due to a malicious attack. 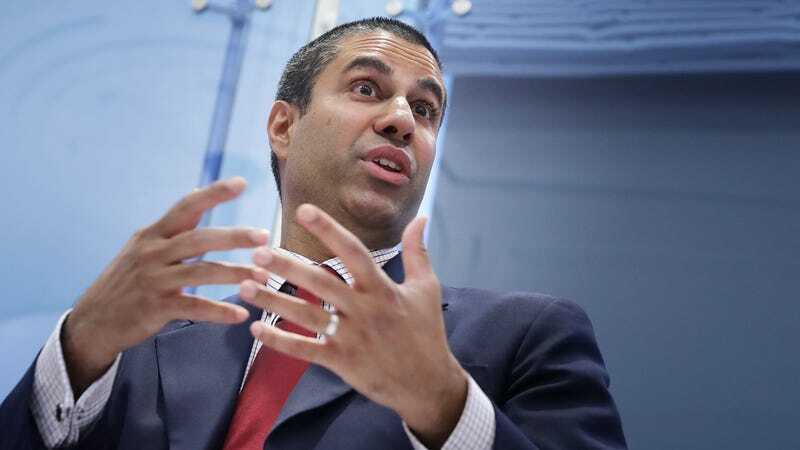 This week, the FCC refused to release under FOIA a batch of more than 47,000 complaints pertaining to the agency’s handling of net neutrality issue, arguing that doing so was a task too burdensome for the agency. “They’ve continuously refused to provide meaningful answers to basic questions about these alleged DDoS attacks, and have utterly failed to address very serious issues that have plagued their comment process and interfered with the public’s ability to participate,” said Evan Greer, executive director of the pro-net neutrality group Fight for the Future. The agency has received more than 9 million comments from the public on the topic of net neutrality, according to USA Today. The FCC’s plans to rollback net neutrality—which were endorsed by the Trump White House yesterday—are opposed by America’s largest internet companies, including Apple, Amazon, Microsoft, Twitter, Google, Facebook, Netflix, Pornhub, Reddit, Dropbox, Yelp, and Spotify, among others.